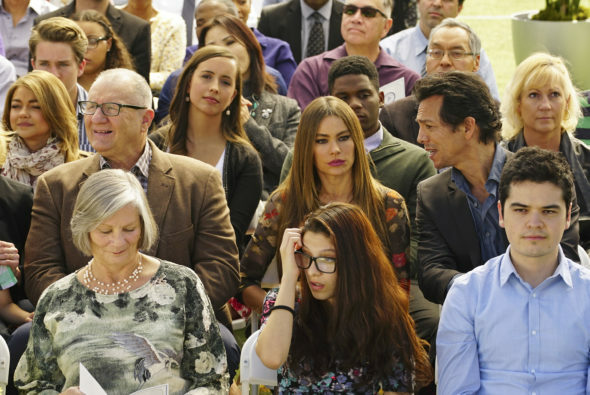 Will there be another season of Modern Family or not? Deadline reports negotiations are underway for an 11th season of the ABC TV show. Currently in its 10th season, the long-running comedy revolves around three Los Angeles families who are interrelated through Jay Pritchett (Ed O’Neill) and his adult children, Claire Dunphy (Julie Bowen) and Mitchell Pritchett (Jesse Tyler Ferguson). The cast also includes Sofia Vergara, Ty Burrell, Eric Stonestreet, Sarah Hyland, Ariel Winter, Nolan Gould, Rico Rodriguez, Aubrey Anderson-Emmons, and Jeremy Maguire. According to Deadline, O’Neill, Bowen, Ferguson, Stonestreet, Burrell, and Vergara are close to finalizing their contracts for an 11th season of Modern Family. ABC has not yet announced a renewal, but we will report any news as soon as it becomes available. What do you think? Do you watch Modern Family? Do you want an 11th season? More about: ABC TV shows: canceled or renewed?, Modern Family, Modern Family: canceled or renewed?